Nickerson Business Systems is a supplier of data processing solutions for small and medium-sized distribution firms and light manufacturers throughout the US. We also specialize in supplying small market niches with industry-specific office automation tools. Our foremost concern is providing expert care to people who otherwise do not wish to become computer experts. We have created and continue to provide software solutions for wholesale distributors and light manufacturers. We can expertly modify the software to meet our customers' needs. We take charge of successfully implementing your systems. We continue to evaluate and supply the finest, fastest, most cost-effective computer equipment available. We develop long-term relationships with our superb support. Many of our customers have been with us for over 20 years. If you are a small or medium sized business, we can in essence become your IT department, saving you the expense and burden associated with full time IT department employees and service contracts. 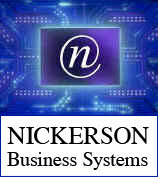 Nickerson Business Systems is not a giant company with a giant marketing budget. And we like it that way. We depend on our clients to refer us to future clients and, thus we must continue to provide excellent, personal service. We are quite proud of our referral list. Visit our "Case Studies" page and read about some of our success stories.